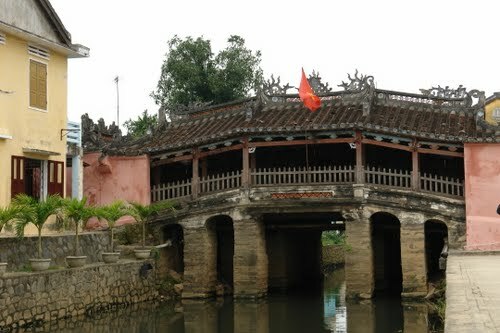 Chua Cau Bridge (Japanese Covered Bridge) is seen as a symbol of Hoi An ancient town, also known as Bridge Pagoda or Chua Cau or Lai Vien Kieu. 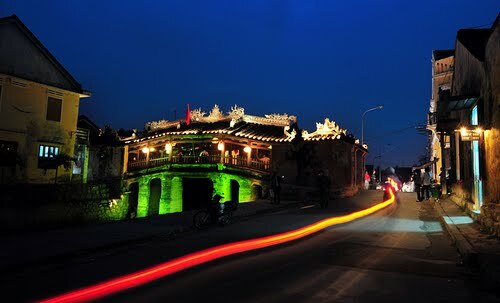 This pagoda is located on the bridge about 18 meters long, curved squeezed through a small creek flowing into Thu Bon River, connect Tran Phu street with Nguyen Thi Minh Khai street. 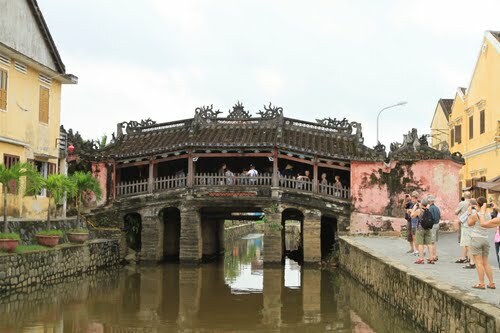 The bridge was built around the 17th century by the Japanese businessmen, but according to Vietnam architecture. In 1653, the bridge was built more pagoda section, connecting to the railing and protruding middle. 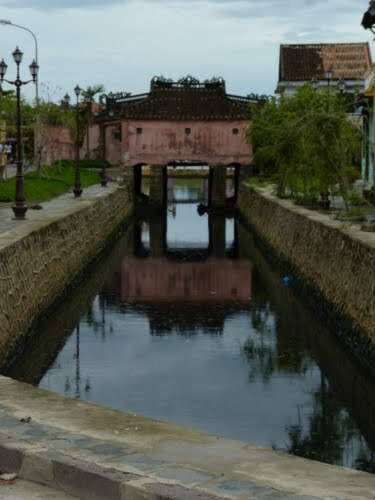 Since then, the locals called Chua Cau or Japanese Covered Bridge. 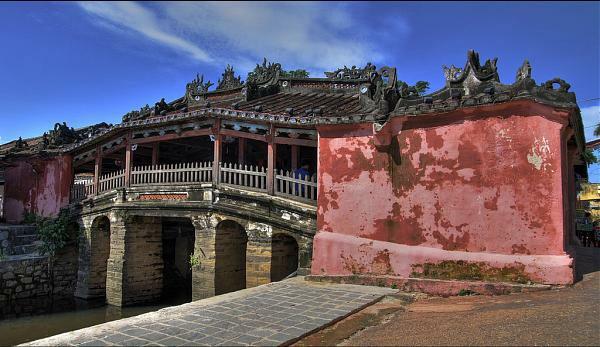 In 1719, Nguyen Phuc Chu Lord was visited to Hoi An, and named for the bridge Lai Vien Kieu. Later, Japanese Covered Bridge underwent several restorations, and change shape. Appearance today is formed from restorations in the 18th century and 19. The decorative scheme of porcelain plate or porcelain glaze is characteristic expressions of Nguyen Dynasty architecture. 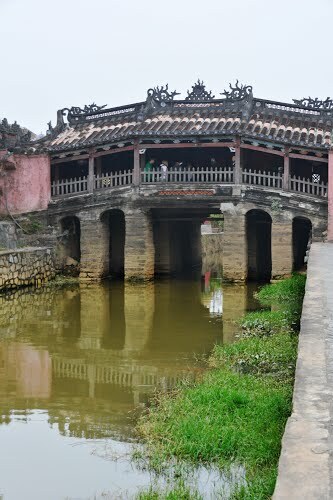 Pagodas and bridge are carved meticulously wooden, and the facade turned toward the river. From the outside, Japanese Covered Bridge has a curved roof, supported by a system of structural wood, and the foundation is arch pillar stone. Bridge deck is Curved, the walkway is paver wooden, the two sides have small wooden pedestal. Pagoda part separated from the bridge by a layer of wooden walls and doors. The roof is yin-yang tiles and covering the bridge. On the main door there is a large sign, embossed three kanji - Lai Vien Kieu. 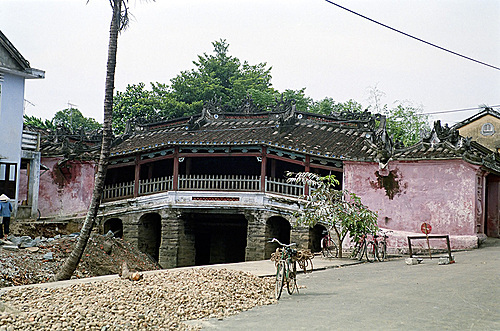 Although called the pagoda but no statue inside, which worship a wooden statue of Bac De Tran Vo - Gods protection land, giving joy and happiness to everyone. 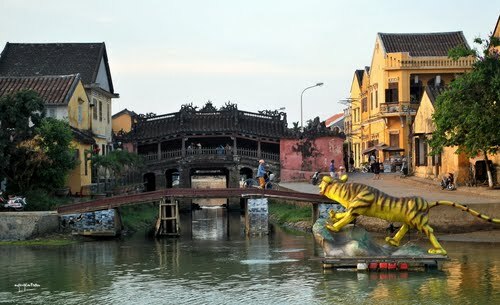 At each end of the bridge, two sides are two statues, a monkey statue and a dog statue. The statues in sitting posture were carved jackfruit wood, forward each statue has an immolate incense bowl. According to legend, headed of Mamazu monster located in Japan, the tail in the Indian Ocean, and the body in Vietnam. When Mamazu move will cause earthquakes, natural disasters, floods. So the Japanese uses monkey and dog gods to prop town the monster. 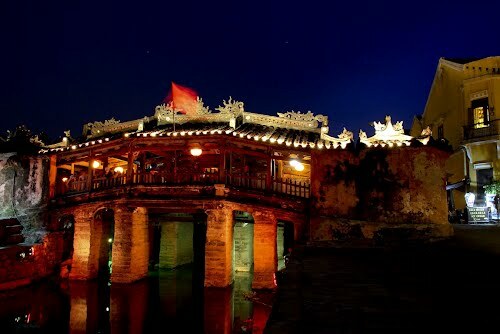 Japanese Bridge, Chua Cau, Hội An Ancient Town, Vietnam.